Assisted living is an ideal retirement option for any elderly individual who does not need the skilled or continual medical help that a nursing home provides. Many seniors find assisted living to be a good way to stay independent and be part of a community. It is an ideal option if you find yourself in need of assistance with the activities of daily living but can generally still make decisions for yourself. You need help getting in and out of the shower or bath safely. You need assistance with general housekeeping, laundry, preparing meals, etc. You need help managing and/or remembering to take medication. You need assistance with aspects of personal care like hygiene and dressing. You need occasional supervision for your personal safety. When deciding between assisted living options, you need to consider each residence’s values, cost, location, services provided, and staff present. 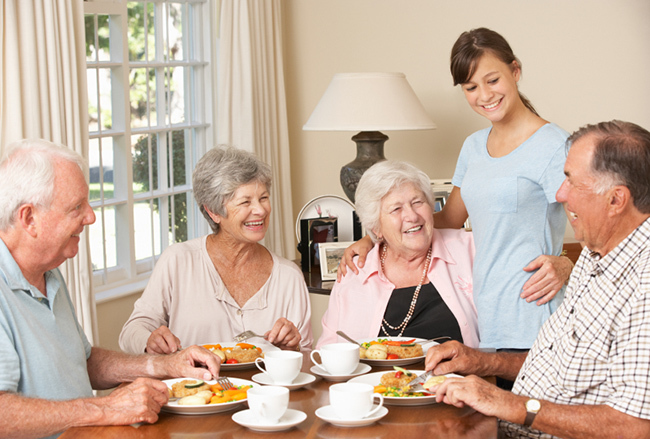 An assisted living facility should feel like a normal community. This means being afforded dignity and respect—including having your personal possessions and funds respected— privacy, and having freedom of choice with your personal activities. If you have any grievances or complaints, you should expect them to be listened to and addressed rather than ignored. Look at what is available in the surrounding area. Although all services are usually provided in an assisted living residence, easy access to diners, shops, movie theatres, parks, or other recreational activities you might enjoy is important. If there are loved ones or friends you may want to visit you, try to find a location no more than a 30-40 minute drive away to make travel easier on them. Not all residences will price their services the same way. Some are package deals and some offer a la carte options. Look at not only the services you currently need but also the ones you may end up needing over time. Additionally, you should learn about any specialized care or services offered such as Alzheimer's, dementia, incontinence, or other issues that require specialized assistance. Ask about the ratio of staff to residents and ask if they will be able to meet your needs. Although assisted living residences have to have adequately trained and certified staff and nurses, ask if they are there 24/7 or on call in the event of medical needs. Assisted living communities provide regular medical care like a nursing home, and should still be able to provide some form of aid if circumstances call for it. Since 1996, TheCareGuide.com has been an online repository of information and guidance source for seniors and their families. It provides insights into elder care and housing solutions covering the full spectrum of choice from staying at home with Home Care or Community Support, to Retirement Homes that provide Independent to Independent Supportive Living, Assisted Living, Memory Care, Long-Term Care, and Hospice and Palliative Care. More information and advice on senior living solutions can be found by contacting us at 1-800-311-CARE (2273) or info@thecareguide.com.